This is one of my favourite pieces in my collection. 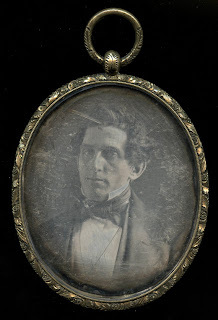 A fairly large gold mourning pendant houses a daguerreotype of a slightly older well dressed gentleman. 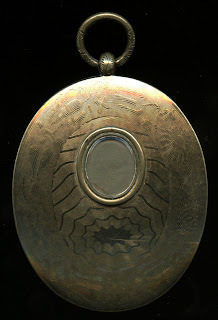 The pendant is just under three inches tall and about 2.3 inches wide. At the back is a repository that may have at one time held a small photo or possibly a lock of hair. It may be empty now or if there was something, time has destroyed it. I have not opened the repository as I'm afraid of breaking it.